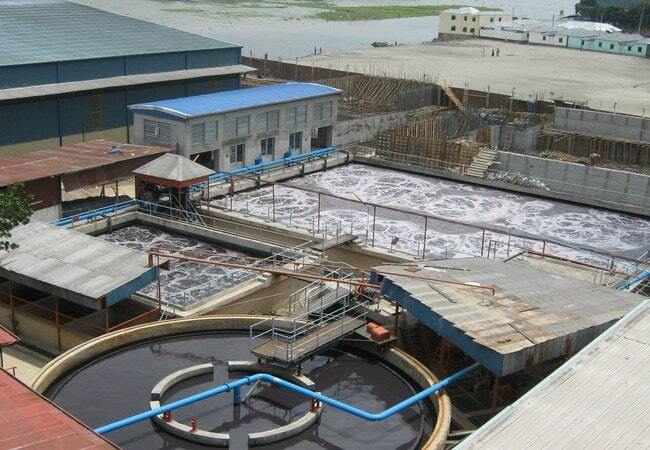 Various developments in the effluent treatment processes have been reported in this article. Excess of caustic alkalinity can be removed by using carbon dioxide in the flue gas from the boiler. By this means, the alkalinity can be reduced to pH 9 at virtually no cost. The color of the dye house effluent can be eliminated by treatment with hydrogen peroxide in the presence of iron salts- the process is more environment-friendly and produced very little sludge. Physical methods such as dilution, equalization, gravity separation, floatation, screening, sedimentation, centrifugation, adsorption, membrane separation etc. these treatments mostly remove suspended, precipitated or flocculated solid particles. Chemical methods like neutralization with acid or alkali, coagulation with alum, iron slats, etc. followed by flocculation and sedimentation, lime treatment to reduce sodium hypochlorite or hydrogen peroxide, reduction. Biological methods consist of aerobic digestion, plant absorption, percolating filters, bio scrubbers, bio filtration, etc. to reduce BOD of the effluent within the stipulated limit. The textile effluent treatment processes may be certified out in several stages. Preliminary treatment processes of dye waste include equalization, neutralization and possibly disinfection. Primary stages are mainly physical and include screening, sedimentation, floatation, and flocculation. The objective is to remove debris, un-dissolved chemicals and particular matters. Secondary stages are used to reduce the organic load. It consists of a combination of physical, chemical and biological methods. Tertiary stages serve as polishing treatments such as adsorption, ion exchange, chemical oxidation, reverse osmosis etc. This should be considered as the first stages of the effluent treatment plant. The coagulation is a process, which involves precipitation of impurities to produce microflocs. This can be achieved by pH adjustment or by addition of inorganic or organic coagulating chemicals. A subsequent process, flocculation, entails aggregation of microflocs into larger agglomerates. The precipitate is then removed by either floatation, setting, filtration or other physical technique to generate a sludge that is normally further treated to reduce its water content. Relatively simple equipment with low capital cost. Significant reduction of COD and, if filtration is used, of suspended solids. Considerable volume of sludge is generated which may contain hazardous chemicals and, therefore, enough disposal facility will be required. The chemicals are to be added on a continuous basis. Carry-over of synthetic polyelectrolyte, if used, can have detrimental effects on the sewerage treatment. Oxidative processes are currently being used in the industry for discoloration treatments of wastewater, for sterilization of water and for biological treatments. A variety of oxidation techniques can be used to decolorize dye wastes. These oxidative processes for waste water treatment comprise biological, UV (ultraviolet) irradiation, incineration and wet oxidation (low pressure or high pressure) and oxidation with sodium hypochlorite, hydrogen peroxide, ozone and nitric acid. Various absorbents such as activated carbon, inorganic substances with high surface area, synthetic ion-exchanges, neutral and synthetic bio adsorbents, can be used for treatment of dye effluents. For maximum efficiency, the concentration of impurities in the feed stream should be as constant as possible to avoid the release of absorbed material back into the stream if the concentration falls. For multicomponent mixtures, the strongly bound species may displace more weakly bound components. The method is based on the fact that certain varieties of bacteria degrade selected organic compounds into simpler compounds through metabolism. This may occur under aerobic (presence of free oxygen) or anaerobic (absence of free oxygen, reduction process) conditions. It is important that the type and concentration of metallic substances (e.g. Zn, Cu, Cr) and conditions such as pH (preferably below 7), temperature (preferably below 35°C), and so on, that kill off the organism population are carefully controlled. For better economy, some efforts have been made to recycle water as well as chemicals instead of removing wastes before draining. Chemical and biological methods can be used to treat water for recycling, but waste chemicals cannot be recovered by these treatments- those are either destroyed or contaminated during the treatments. Reverse osmosis process, on the other hand, can separate 80-955 of the chemicals present in the original waste stream.